The reason for the specificity of tree and moisture content of the lumber had to do with the epoxy that would be used to bind it all together. Every joint and every plywood seam and every place where plywood contacts a member gets epoxied. Epoxy won’t bind well if the lumber is green, wet, or is of a species of wood that is high in natural oils. Generally, I had big long 16 and 20 foot 2×4 lengths. The boat has a 20 foot long top deck, and because of the rake at the ends, is 16 foot along the bottom. There are also 8 foot long beams across the boat (“athwartship” in boatbuilding-speak) and a bunch of little stuff that would be ends, posts, etcetera. But the plans called for ripping every piece to some new width, some 3 inches wide some 2-1/2. 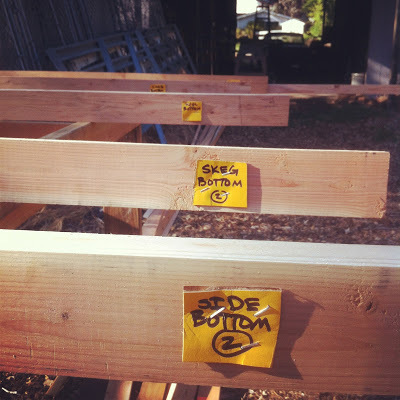 A finish 2×4 from the lumberyard is actually 3-1/2 x 1-1/2 with smooth rounded corners. Instead of taking a half inch off of a side to make a 3 inch thick piece, the plans called for taking off a 1/4 inch on either side. The reason for this is sensible: Cutting off the rounded edges of the lumber makes a better joint when it is epoxied. 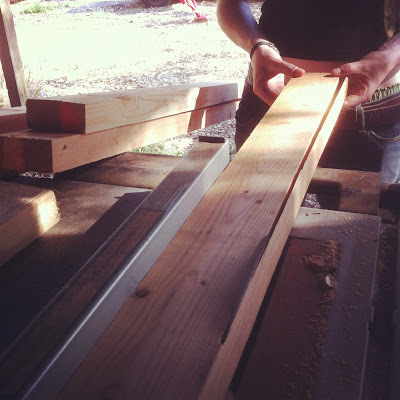 So we spent a whole day feeding 16 and 20 foot long lengths of lumber into the tablesaw… twice. 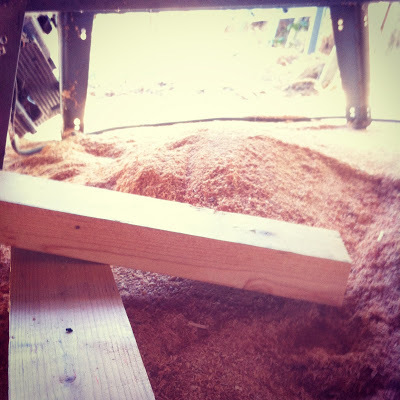 We made lots and lots of sawdust.